The cornerstone of diabetes management is tight glycemic control. The first line of action upon noticing any symptoms of type 2 diabetes should be lifestyle changes, i.e., managing blood glucose levels by regulating diet (both quality and quantity of nutritional intake) and exercise. Through these changes, individuals diagnosed as prediabetic can often check their progression to full-blown disease. Individuals diagnosed with diabetes, who are taking medications can also benefit from these lifestyle changes. Diet: High blood sugar levels can be managed by reducing caloric intake, either by careful portion control or by choosing foods that have lower glycemic loads. Foods made from refined sugars and easily digestible starches, such as white bread, sugary drinks, etc., lead to sudden increases (spikes) in blood glucose levels and are likely to promote metabolic imbalances. On the other hand, foods rich in fiber, such as whole grains, fruits, and vegetables take time to be digested, do not prompt rapid rise in blood glucose levels, and favor metabolic balance. Exercise: Exercise has many health benefits, the most obvious of which may be improved glucose homeostasis and insulin sensitivity. Exercise stimulates skeletal muscles to take up more glucose from the blood. In addition, it reduces the amount of lipids stored in fat cells, while also making them more sensitive to insulin action. The food that we eat is our main source of glucose. Starches and sugars in our food are digested and glucose is absorbed into the blood (Figure 1). Some cells in the body, such as brain cells, can take up glucose without insulin, via specific glucose transporters (GLUT 3). Most other cells, such as muscle and lipid cells, require insulin function in order to take in glucose from the blood. Once in the cell, glucose is either used for energy or stored (for example, as glycogen in liver). During periods of starvation, the hormone glucagon triggers conversion of glycogen back to glucose. When kidneys filter the blood, any unused glucose enters the filtrate. If needed, this glucose can be reabsorbed, while excessive amounts of glucose in the filtrate can be eliminated in the urine. Figure 1 shows an insulin centric view, where the presence of insulin is critical to glucose uptake by cells. 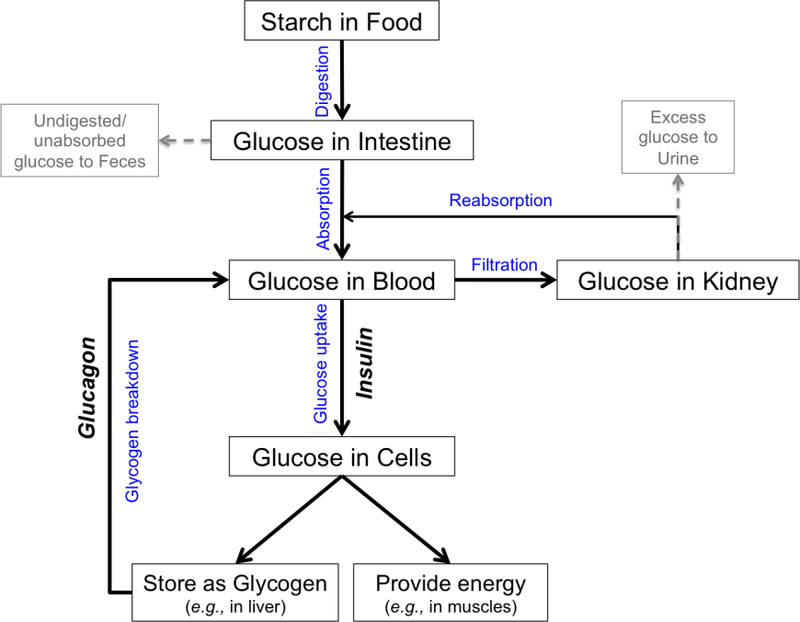 Figure 1: Concept map of glucose homeostasis highlighting key steps from food ingestion, digestion, absorption, and use to excretion. Insulin binds to cell surface receptors to initiate a signaling cascade (Figure 2) that in turn mobilizes glucose transporter proteins to the cell surface to take up glucose. In the absence of the insulin generated signals, these transporter proteins are sequestered in the cell so the cells cannot take up glucose. Exercise activates other signals that can also translocate GLUT4 transporters to the cell surface. This is one of the mechanisms by which exercise increases insulin sensitivity. 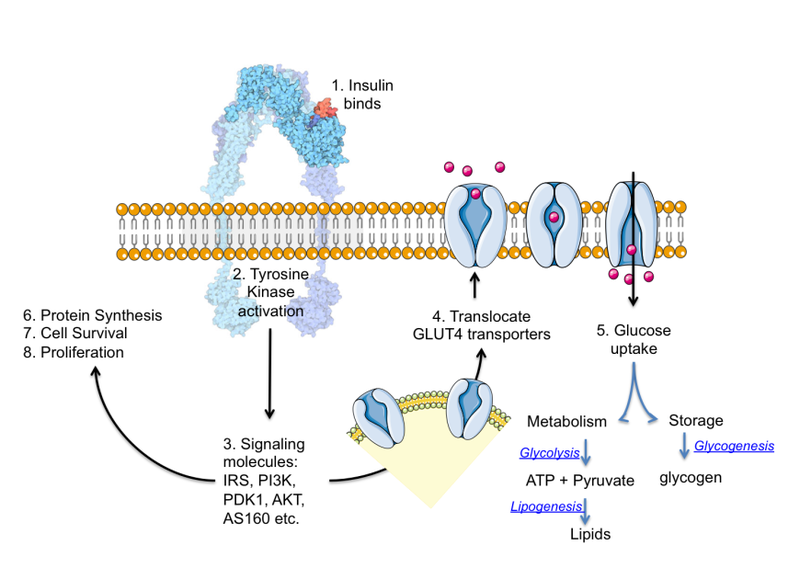 Figure 2: Insulin directed glucose uptake involves many signaling molecules. Insulin binding to its receptor (http://pdb101.rcsb.org/motm/182) induces translocation of the GLUT4 glucose transporter to the cell surface. Some molecules playing key roles in insuling signaling (listed in step 3.) include Insulin Receptor Substrate (IRS), Phosphatidylinositol-4,5-bisphosphate 3-kinase (PI3K), 3-Phosphoinositide dependent protein kinase-1 (PDK1), Protein Kinase B (AKT), and Akt substrate of 160 kDa (AS160). Portions of the figure were adapted from Servier Medical Art.